I spent today running errands and doing some botany work at the Field Museum. 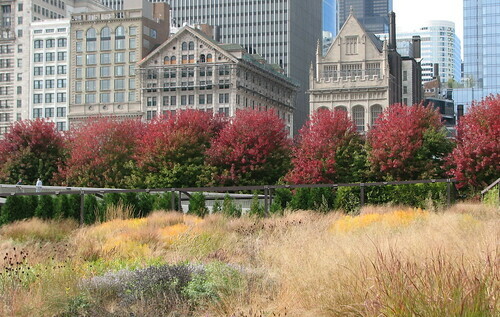 Since it was such a gorgeous day, I dawdled a bit in between and visited the Lurie Garden. I think it's the first time I've seen it in autumn. It's pretty amazing how the garden changes throughout the year; just a few months ago it was the most vivid river of purple salvia imaginable, and now it's all soft gold and green. 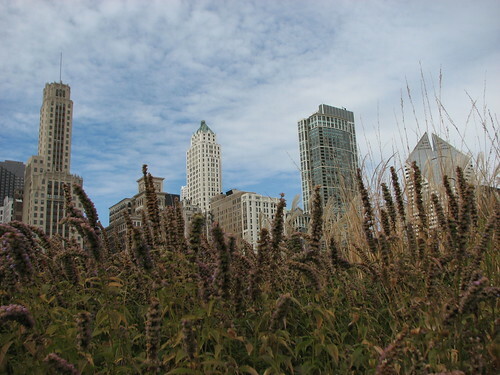 The iconic Lurie shot; I wonder how many times have I taken this picture? 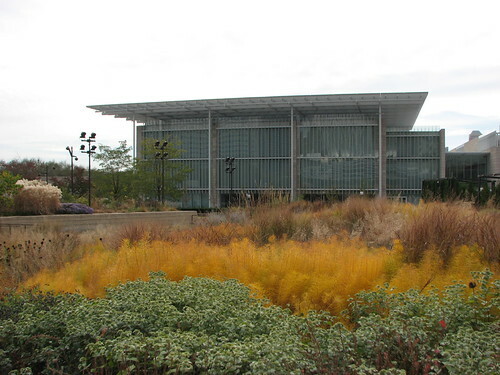 Since construction of the Art Institute's Modern Wing, this has become the other "iconic shot." That's Amsonia hubrechtii glowing like fire in the middle. Looking west towards the Michigan Avenue streetwall. I love how each maple is turning red from south to north. 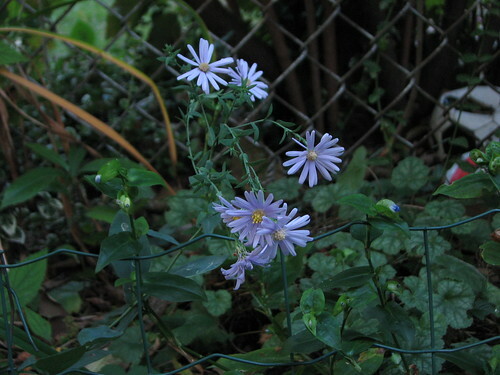 Chicago blues: asters and something (delphiniums?) 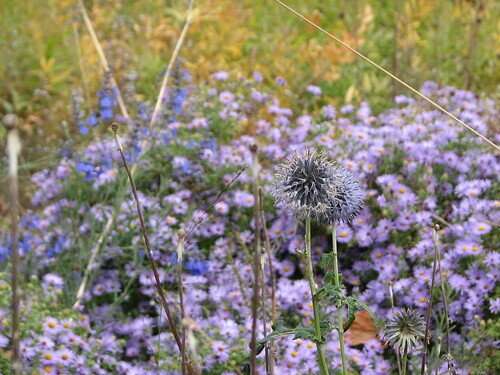 in the background, echinops going to seed in the foreground. 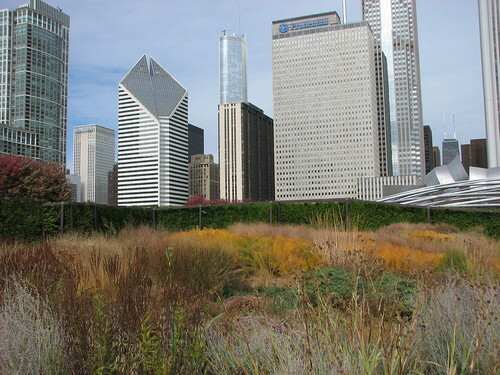 To envision a city on a prairie, you just need the proper perspective. 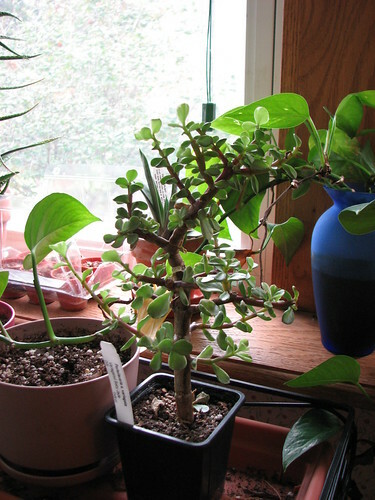 and Portulacaria afra 'Variegata', purchased from a vendor at the Chicago Botanic Garden's bonsai show. I don't know if I will maintain its horizontal branched form or just let it go wild. I certainly do not have the patience for full-on bonsai action, as evidenced by the collection of empty bonsai pots in my basement. 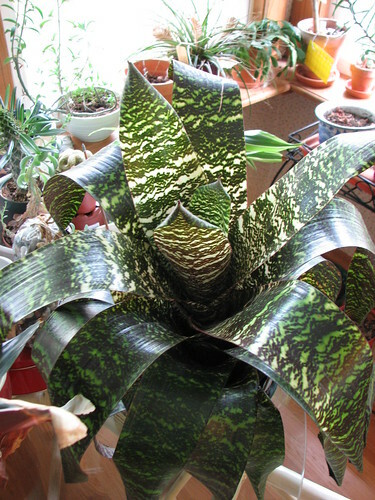 I put some of the houseplants outside for the first time this year. Usually, indoor plants stay indoors, outdoor plants stay outside, and never the twain shall meet. I mixed it up this year, overwintering a hibiscus and then putting some things out in the summer. Lesson learned: even morning sun is BAD. I nearly lost my treasured night-blooming cereus and another cactus to sunburn. On the other hand, the desert rose thrived and bloomed in the sun (until the wind knocked it off the table; now it sort of....curves) and the yucca put on a bunch of new growth. Trial and error, I suppose, but I'm going to be very reluctant to put anything outside next year. 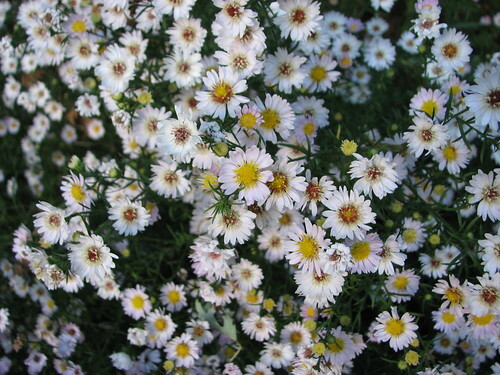 I was told this is heartleaf aster (Symphyotrichum cordifolium) but the leaves are more like arrowleaf aster (S. urophyllum). Whatever it is, I was also told it belongs in shade. I'm thinking that's not entirely correct since this is all it's accomplished in two years. ...and a purple one my grandma gave me. 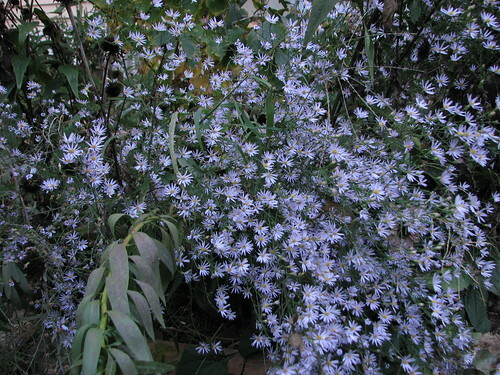 The sky blue asters, S. oolentangiense, always look like lovely lavender clouds. 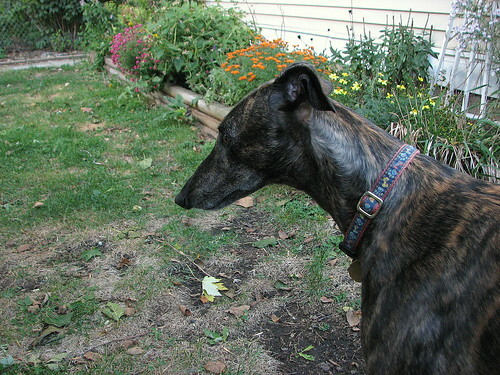 And remember, greyhounds are an important part of any fall garden! 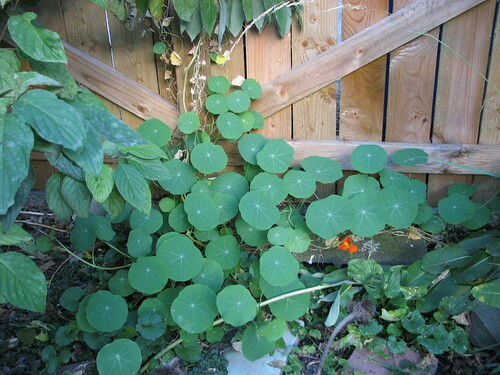 October: Nasturtiums: That's a wrap! It's October in Chicago. 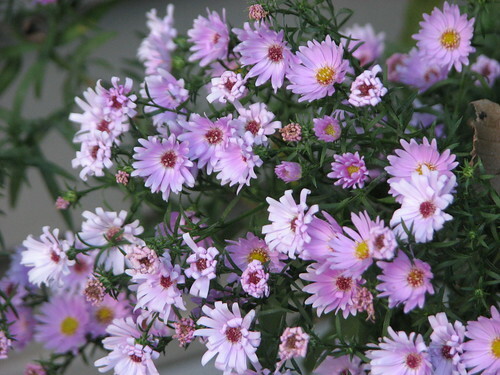 The asters are blooming, the leaves are turning yellow, and the first frost is imminent. The cooler early fall weather has been a boon for the Spitfire nasturtiums, which rebounded from their bedraggled summer state and are still full and green. The nasties by the house filled in all around the purple aster that has just started to bloom. 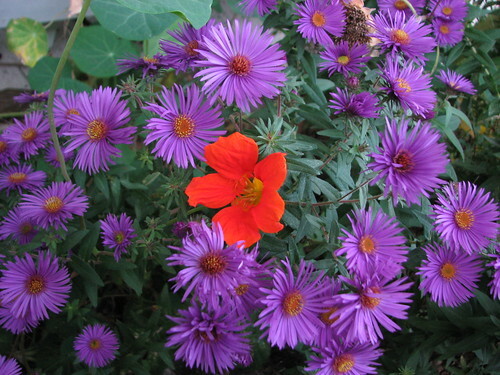 The purple and orange would make a striking color combo if only the nasties would produce more than two or three blooms at a time. 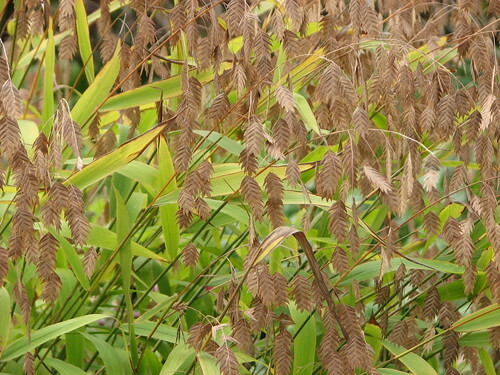 Still, the contrasting foliage shapes look nice together. 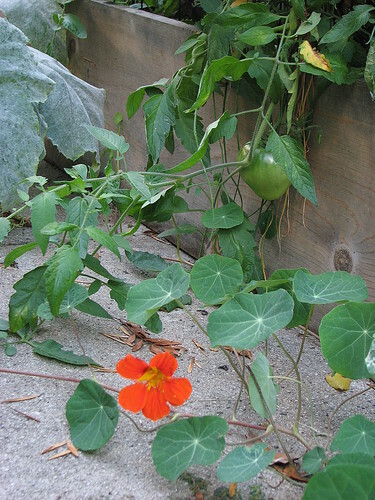 I like the idea of using nasturtiums as ground cover in the fronts of gardens and intend to try it again in the future. The nasturtiums by the alley fence didn't like being trained up the fence, but the vines on the ground did well in their shady spot. Still very few flowers, but the foliage softens the boundary between fence and ground and has a cute woodlandy look. You can still see the sad yellow vines that I had trained upwards. What have I learned doing this project? 1) I can't comment on other nasturtium varieties, but at least the Spitfires do best on the ground. 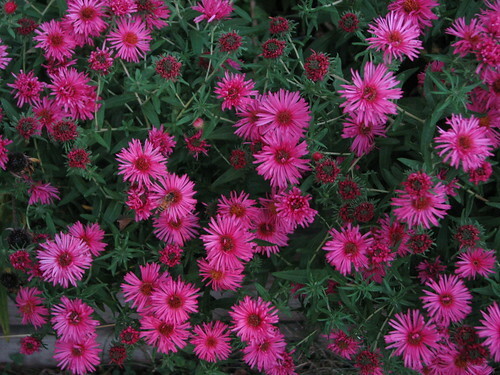 Planting them in a crowded spot and hoping they'll fill out up on a trellis does not work. Even draping the vines upward doesn't work, as the vines soon become spindly and yellow. Mine also didn't do great in containers; the leaves were smaller and the vines stayed short. 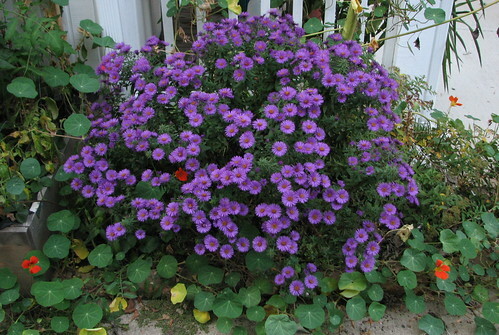 2) The Spitfires didn't flower as much as I was hoping, which is too bad because I love their color. I'd like to try other nasturtiums, perhaps yellow ones, that flower more reliably. However, nasturtium foliage is very cool and is worth the effort by itself. 3) Wintersowing is totally the way to start these babies. Direct sowing, for me, was a complete failure, and I have no patience for grow lights and hardening off. 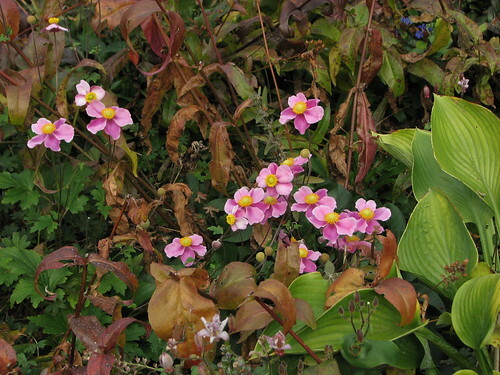 4) The hottest part of the summer is rough but with enough water, the plants will pull through and look lovely in the cooler late summer and fall. My plants survived both in full sun and mostly shade. Special thanks to Mr. Brown Thumb and to Renee's Garden for putting this project together. I hope everyone had a good time and that the shared feedback has been useful! I've enjoyed seeing everyone's stories and hopefully we can do this again sometime. Cheers!